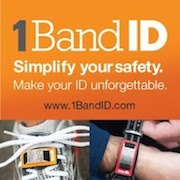 DETROIT RUNNER....: A sponsored race - Attn: Michigan runners! 3 miles on the schedule today.....done! I'll be taking off the next couple days now for a mini taper so I'm ready for the Back to the Beach half marathon(#7) on Sunday. This is the first time since I've been running that I did not feel ready for a half marathon race so it should be interesting. So yesterday I got some awesome news. 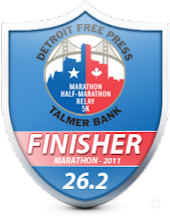 As you may or may not have heard Renewal by Andersen of Detroit is sponsoring some runners for their team at certain races. All you have to do is follow some instructions that they have and they pick various people to run in the races they are involved in. The great thing is that I got picked to run in one of the races they're involved with. I know at least a couple of fellow bloggers have already had a chance to run in some other events and I also know that Renewal by Andersen of Detroit will have more in the future. In fact, I know they are going to be involved with the Solstice Run which most of you know if one of my favorite runs that is the following weekend of this race. Perhaps you will have a chance to win! So the race I'll be running? Borrowed from their Website - click the picture to see it. Ok, ok --- sorry to burst your bubble but I'm just running the half marathon(#8) but I'm super excited to run this inaugural run on Renewal by Andersen of Detroit's team! Wow - I'm on a team AND sponsored - it's a dream come true!!!! For the record, Brandon with Renewal by Andersen of Detroit would have sponsored me for the full marathon but I'm not up for running another full six weeks later. I sure can handle the half though. This race looks like a challenging(read hilly) course and I love the City of Ann Arbor and can't wait to run on U of M's campus. There's still plenty of time for you to join me and run this race as well. The race is June 17th - what better way to spend your morning of Father's Day? I mean, it is my day after all. While I can't convince my family to get up that early(haha! ), the race starts early enough that will still leave time in the day to enjoy much of the day with them. I'll be sure to do a complete race review after the race as well. To top it all off, I get to run in this sweet shirt from Renewal by Anderson. Check out the back of the shirt. What a great saying for a shirt! The company is even sending it to me early so I can run with it on several runs so I don't run with it the first time out at the half marathon. It's the star treatment for their runners! I can't wait to meet everyone else running it with them. 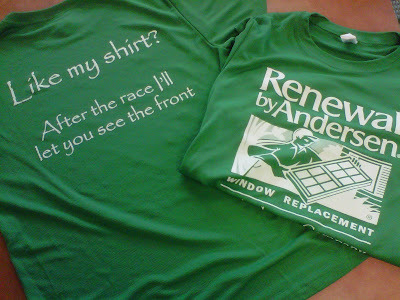 Interested in seeing if you can win a race entry to a race and be sponsored by Renewal by Andersen of Detroit? Check out their Facebook page by clicking HERE, "like" their page and you will see opportunities to get involved in upcoming races. Kudos to the company for helping support not only the community with many charity races but also the running community as well. 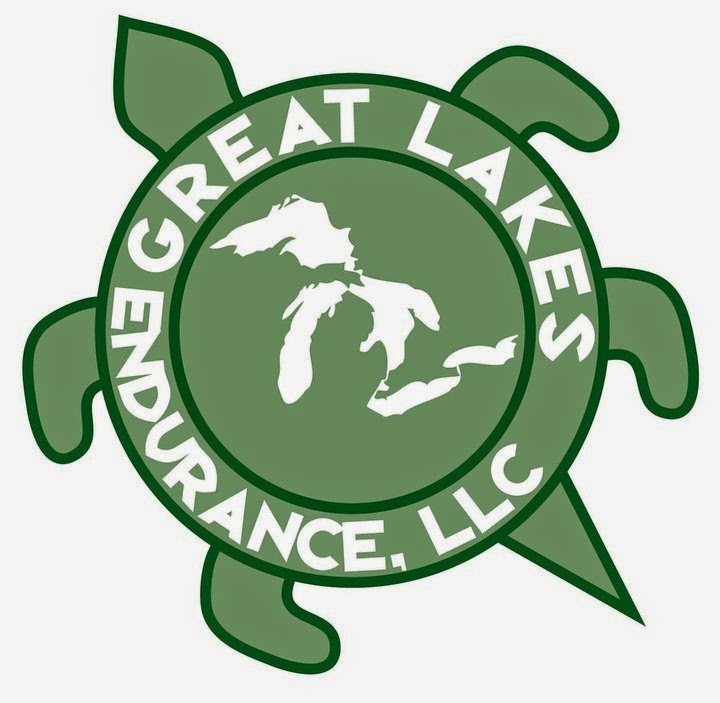 * Note: While I received a free race entry and shirt, this blog post was not required by Renewal by Andersen of Detroit and all opinions in this post are my own including wanting to share this news. congrats! i'm doing the girls on the run 5k with them on sunday. Brandon is the nicest guy ever too. I really hope other runners in the area try to get sponsored too because they do it for some great races. Way to go Jeff! As you know, I signed up for the full probably 16 seconds after the registration was open (I want a single digit running number). You'll be easy to spot in the Green. It will be Hot and Hilly, but yes, since it's father's day, I expect to be catered to once the event is over. Oh my gosh, I never thought of that! Sorry, Jeff, but I just may be throwing some stones through them anderson windows of yours. Haha, too funny about the green shirt comments. Hopefully you don't get hassled TOO much. ;) That is one race that I'm definitely interested in. Being a Wolverine, I'd love to run a race in Ann Arbor and still haven't yet. Unfortunately, I think I've convinced myself to take time off in June. I'm glad you're going to run because I know it means a great review will follow, and maybe I'll get to try next year. Didn't think about green in Maize & Blue country. I can take it!!!! Haha! I love the saying on the back of the shirt! Congrats on the sponsored race! That is awesome! Your race you selected looks pretty cool! I miss Detroit! Congrats on the free race entry. I had missed that they were sponsoring that one. I am "running" the half as well...using the term very loosely because I am battling an injury and running the Bayshore half Memorial Day weekend. Should be a fun, hilly inaugural race though. Are you doing Dexter Ann Arbor as well or am I remembering incorrectly? I did that one last year and love the course...this one will probably be much hillier though as it's more "Ann Arbor" and not just running along Huron River Dr. I love the Bayshore race. I think I'm going to run it again next year(the half only) I did the full in 2011. I am not running Dexter to Ann Arbor but that looks like a fun race. It's my running buddies favorite half marathon. They are still looking for runners; I was able to get a sponsorship for the 17th. There are other races that day, too, and I was told to spread the word! Is it required that my running attire be Maize and Blue? If you want to be fashionable and look really great, Maize and Blue is recommended, but we are very gracious here and you can wear any colors you want! Thanks Mark. I saw that too. They need to say this otherwise, there would be many not coming. Haha! Should be a fun race(for me); you - eh, not so much. Tough marathon in summer. Haha!